Penthouse #905 at the renowned Hotel des Artistes offers a discerning buyer the opportunity to acquire one of the most impressive spaces in Manhattan. This extraordinary approx. 5,377 square foot residence represents a unique marriage of two exceptional 20th century architectural styles. Designed by late legendary architectural icon Ettore Sottsass, #905 boasts double-height ceilings, Central Park views and 15 high windows to showcase open northern exposures. Upon first floor entry, youre met with a striking great room measuring 55x216 paired with soaring 189 ceilings. A separate dining area featuring 179 ceilings adjoins the great room to create a massive entertaining space. Alongside living/dining, the first floor is completed with a windowed chef's kitchen, powder room, staff bath and one bedroom guest suite.The mezzanine level features one bedroom with on-suite bath; as well as a windowed balcony overlooking the great room to lead you to a separate dressing room. Upstairs, the penthouse master bedroom suite includes 2 full baths, 2 separate dressing rooms, a media room, kitchenette and study. This spectacular space is completed with an 827 square foot terrace showcasing open views of West, North and East exposures.The 18-story Hotel des Artistes was designed by George M. Pollard, and developed by Walter Russell, in 1917 as an artist's cooperative apartment. At the time, only hotels were permitted to be built to this height; so while the building never functioned as a hotel - hotel amenities were provided. Such include a swimming pool, two workout rooms, squash court, roof garden and highly-regarded restaurant, Leopard at Des Artistes. The neo-Gothic-style building also boasts a canopied entrance, large lobby, concierge and attended elevator.Hotel des Artistes is individually landmarked and falls within the boundaries of the Upper West Side Historic District, as designated by the New York City Landmarks Preservation Commission. Magnificent Park view brand new Classic 8.5 Room/5 Bedroom corner home bedroom home with 7 oversized windows overlooking Roosevelt Park surrounding the American Museum of Natural History. Reimagined by award winning interior designer Stephen Sills, this grand 4,820 sf home features an enormous great room on the Park facing East to the Park and south to West 78th Street, 5 large bedrooms, a spacious library and 4.5 bathrooms. This stylish and grand scale home has 11 ceilings, an exceptional foyer that leads to a grand Gallery and 3 wide oak herringbone floors. The Great Room features East exposures overlooking Roosevelt Park and the American Museum of Natural History as well as historic townhouse views south over 78th Street and an elegant library or a media room. This grand home features a separate formal expanse for entertaining on any occasion.A magnificent separate Park view eat-in kitchen features custom-made Smallbone of Devizes cabinetry with a hand painted finish, six burner Miele range with separate Miele refrigerator and freezer. The kitchen is finished with White- Carrara-honed- marble countertops with full height slab backsplash. Through the Gallery hall we find the bedroom suites. The master suite features south facing townhouse views and a windowed bathroom elegantly completed with radiant heat Snow White marble slab flooring, Snow White marble slab walls and counter, oversized Kaldewei tub, Waterworks fixtures, custom designed and painted vanity cabinetry and Ralph Lauren lighting.The second suite features Carrera Marble herringbone-patterned floors, White Whisp marble shower walls, blue de Savory honed marble countertops and Waterworks fixtures.The third and fourth suites are completed with full baths featuring glazed ceramic penny tile, Jura Grey honed marble countertop and tub deck, Waterworks fixtures and a Kaldewei tub.Last but not least, is a large laundry room with sink and side by side washer and dryer. The room also functions as a closet and provides plenty of additional storage. 101 West 78th St is a full-service building originally constructed in 1886 by Emile Gruwe and elegantly reimagined today by Stephen Sills, an Architectural Digest AD 100 designer. The building features 24- hour attended lobby, fitness center, playroom, bicycle storage, stroller room, cold storage and more. Individual storage spaces are also available for purchase. The complete offering terms are in an offering plan available from Sponsor. File No. CD13-0137. 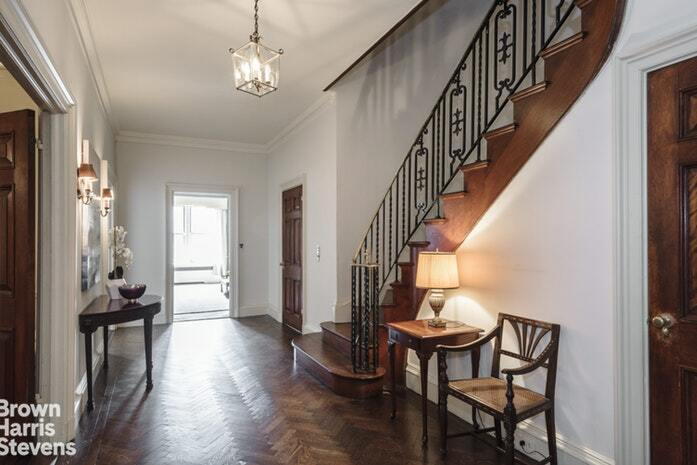 Property address: 101 West 78th Street. 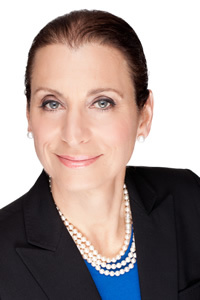 Sponsor: 101 West 78th, LLC, 787 Seventh Avenue, 50th Floor, New York, NY 10019. Equal Housing Opportunity. Anticipated 20-year 421a Tax Abatement. Closings Commence in 2019.This corner three-bedroom, three and a half bath residence captures north and west views with expansive floor-to-ceiling windows in every room, the dramatic living room with Hudson River views spanning up to the George Washington Bridge provides gracious entertaining space and separate dining room. An enclosed alcove provides flexible home office or storage space. Each bedroom enjoys the privacy of an en-suite bath, and the master bedroom suite boasts two walk-in closets. Custom Italian kitchens by Pedini celebrate the discerning tastes of One Waterline Squares residents. Outfitted with Gaggenau appliances and punctuated by polished chrome Dornbracht fixtures, each kitchen will supply fully-vented range hoods, wine refrigerators and garbage disposals. Residents will also enjoy fully-vented dryers. Each bathroom is cradled in a bespoke and indulgent array of stone and wood cabinetry. Private condominium amenities, located on the 15th Floor, include a private 20-seat dining room with catering kitchen, multiple lounge and social spaces, media room, billiards room and bar, great room with fireplace and access to the fully-furnished and landscaped sundeck with outdoor kitchen.One Waterline Square, designed by Pritzker prize-winning architecture firm Richard Meier & Partners Architects, stands at the southernmost portion of Waterline Square, a comprehensive new community joining Midtown with the Upper West Side. A dynamic collection of three distinct towers designed by the worlds most accomplished architects, Waterline Square surrounds a curated new park, bringing lush landscapes through the towers and connecting them to the city. 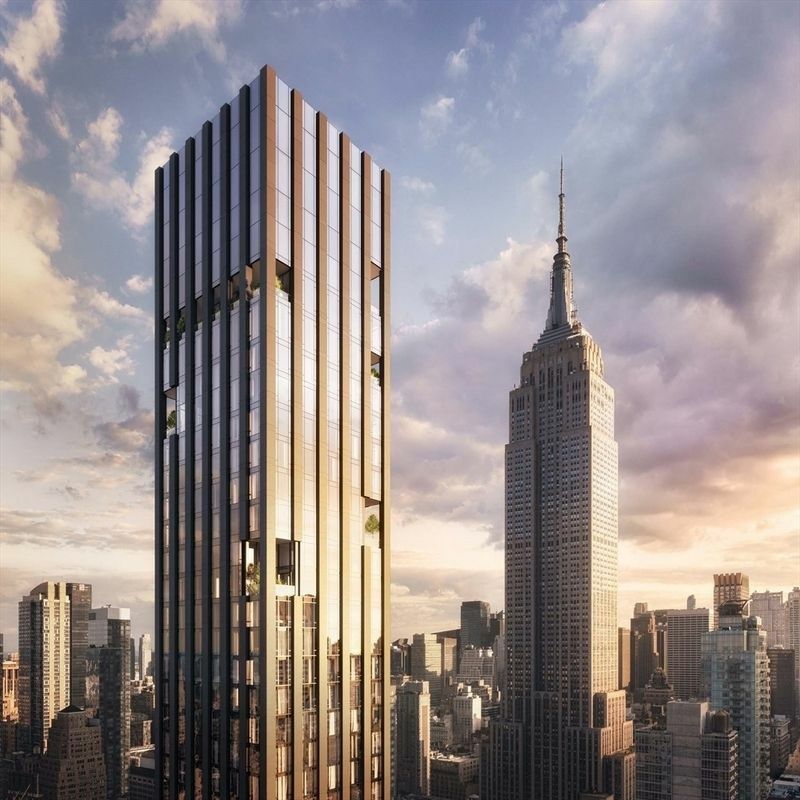 One Waterline Squares striking glass facade commands a full city block between Fifty-Ninth and Sixtieth Streets at Riverside Boulevard, and invites dramatic sunsets over the Hudson River and views of the skyline into the homes. With interiors and a luxurious suite of private amenities by Champalimaud, the fifty-six elegantly proportioned one to five bedroom residences marry the precision of the exterior with great warmth and act as a canvas to showcase high ceilings, enormous windows, and a rich selection of thoughtfully curated materials. The experience at One Waterline Square is remarkable in every way. The condominium lobby looks out onto the verdant central greenspace offering a seamless indoor to outdoor living experience. In addition to the amenities exclusive to the condominiums of One Waterline Square, residents will have access to thousands of square feet of dramatically designed sports, fitness, leisure, and outdoor amenities and features, and an anticipated twenty-year 421 tax abatement. www.waterlinesquare.com Waterline Square elevates the modern residential experience, offering a life that transcends expectations. Rethink how you live.The complete Offering Terms are in an Offering Plan available from Sponsor: RCB3 Residential For Sale LLC c/o GID. File No. CD16-0351. Flip Tax: 2%: Payable By Buyer. This immense 14 room cooperative apartment is distinguished by large and elegant rooms with dramatic views of the East River and Carl Schurz Park. Grand floor to ceiling windows through-out this high-floor classic pre-war apartment afford outstanding and unimpeded southern and eastern light all day long.The floor plan offers a gracious flow: from the private elevator landing, a large central gallery leads to the spectacular corner living room with intricate moldings and a wood-burning fireplace. Adjacent is a huge formal dining room with hand painted Gracie wall paper, along with a handsome library with a wood-burning fireplace. These over-sized principal rooms with 10' ceilings have an impressive scale for entertaining, and there is a powder room conveniently sited off the central gallery.Down a long hallway there are five generously-sized bedrooms with abundant closet space and each with their bathrooms en suite. At the back of the apartment there is a large family room adjoining two staff rooms and a staff bathroom. Nearby is the enormous eat-in-kitchen next to a cozy breakfast room. 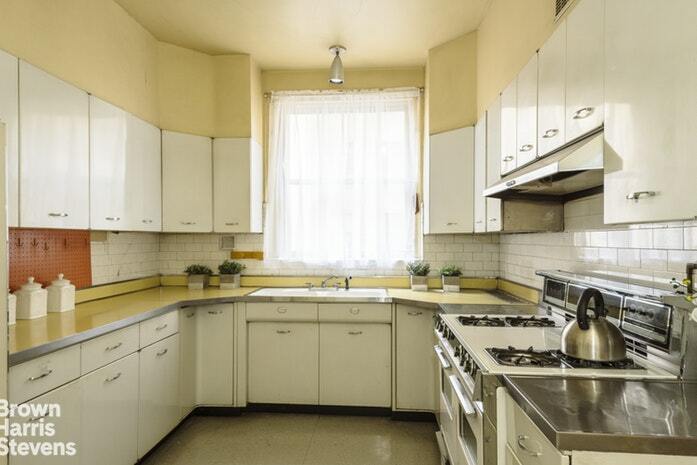 A big laundry room completes this sprawling floor plan, and there is outside storage available as well.Developed by Vincent Astor in 1931, 120 East End Avenue is one of the city's most prestigious ?? ?white glove??? co-ops. Amenities include an elegant lobby, full service staff, a large gym, and a beautiful private garden. Flip Tax: 3%: Payable By Seller. This twelve room duplex treasure presents a buyer with an extraordinary opportunity to restore a pristine Rosario Candela masterpiece. One of only four of the famed C line duplexes at 1220 Park Avenue, this high floor, sun flooded estate apartment is ready for a new life. From a semi-private elevator vestibule the grand entrance gallery with ten foot ceilings and a sweeping staircase leads to three major public rooms. Original details are intact, including the paneled mahogany doors, the brass bullet hinges and the herringbone floors. French doors lead to a gracious living room with WBF, and an adjoining library, both with sunny southern views over Carnegie Hill and the midtown skyline. The massive formal dining room leads to a butler's pantry, and an eat-in kitchen with a huge laundry room with back staircase and a generous maid's room with full bath. Upstairs, another grand gallery has convenient access to the passenger elevator, ample closets and leads to three large bedrooms, each with excellent closet space and private bathrooms. A hall leads to two maid's rooms with adjoining bath and access to the back stair to the kitchen. 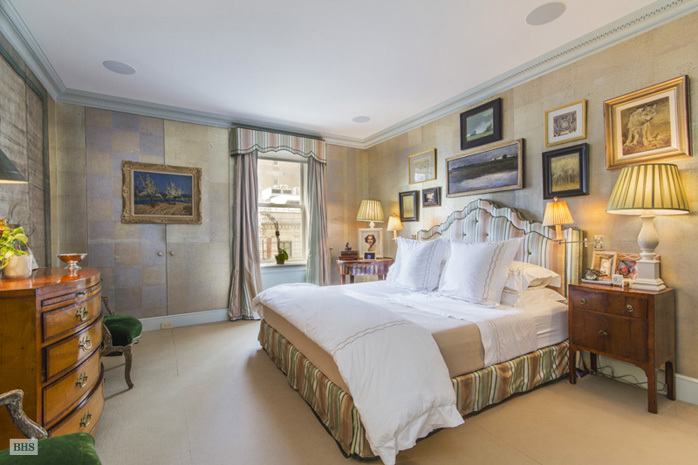 The apartment layout can be used as a five bedroom, or the maid's rooms can be re-imagined in multiple iterations.1220 Park Avenue is one of Carnegie Hill's most elegant coops, known for the grand scale and gracious layouts of its apartments. The building has a full time doorman, a resident manager, private storage, a bike room, and a state of the art fitness center. Additional maid's rooms are available for rent. 50% financing, pets allowed. There is an assessment in place of $886.14 per month until the end of 2019. Flip Tax: 2% of gross profit: Payable By Seller. 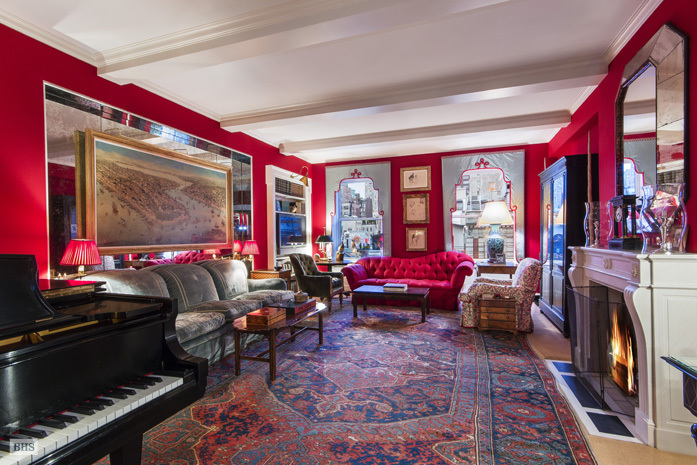 1010 Fifth Avenue, a luxurious and elegant pre-war building, boasts this glamorous four-bedroom, three-bathroom home recently renovated and designed by renowned interior designer, Miles Redd. Building amenities include a full-time doorman, concierge service, basement storage, fitness center, and much more offering an unparalleled lifestyle. The spacious foyer extends to the heart of the home into the formal living/dining room made cozy by a wood-burning fireplace and lovely southern exposure, great for entertaining. To the left of the foyer is the custom eat-in kitchen, with a windowed built in dining nook including top-of-the-line Miele appliances, side-by-side Sub-Zero refrigerator/freezer and Wolf range. Adjacent to the kitchen is the English paneled study/library, with hardwood floors, custom woodwork and nickel-plated hardware.The master bedroom suite presents custom built-in, spacious walk-in closets and a stunning windowed bathroom, hand-cut marble decorates the design and radiant flooring heat, this master bathroom is absolutely exceptional. 1010 Fifth Avenue, 6C is a one-of-a-kind home, presenting the perfect balance of Old World charm and modern sensations. 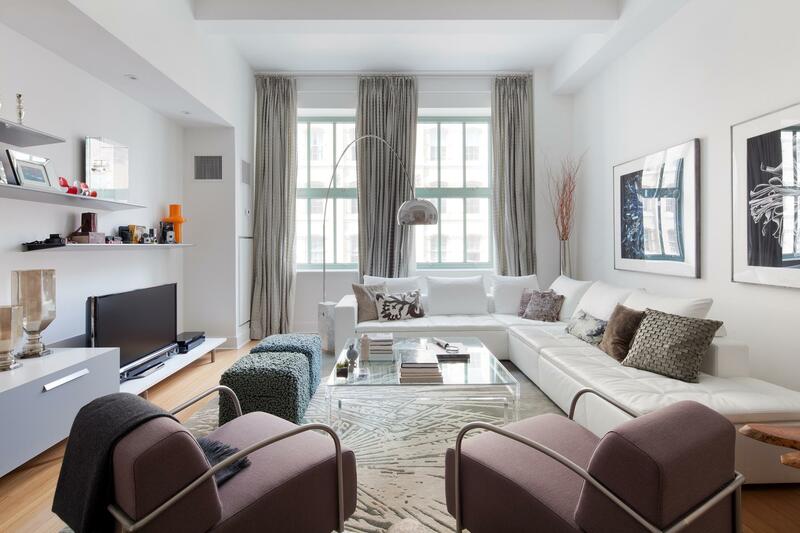 Perched high above historic Madison Square Park, this beautiful three bedroom home offers the very best of New York City living. Located in one of the city's most desirable neighborhoods and one of downtown's top full-service condominium buildings, apartment #9L has a long list of noteworthy features including: stunning park views, all-day light, high ceilings, spacious rooms, luxury finishes, excellent condition and the perfect layout. The coveted "L" line -- the best three bedroom floor plan in the building -- is known for it's large and gracious entertaining space as well as the privacy afforded by a separate bedroom wing. After passing through the beautifully scaled entry foyer, you arrive in the stunning 30' great room with high ceilings and four south-facing windows that offer wide open views over Madison Square Park (including the iconic Flatiron and Metropolitan Life buildings). The modern open chef's kitchen has a large island with counter seating, plenty of storage in the beautiful Poggenpohl cabinetry, separate pantry and top-of-the-line Viking, Wolf and Bosch appliances (including a wine cooler). There is a custom home office space adjacent to the kitchen. The bedroom wing offers three large, bright and quiet bedrooms and two-and-half beautiful marble bathrooms. The master bedroom suite has three custom closets (including one walk-in) and a luxurious bathroom with double sinks, a soaking tub and separate stall shower. The two additional bedrooms have very good light, high ceilings and excellent closet space. This property also has a washer/dryer and comes with a large private storage unit that is located on the same floor as apartment #9L. The Grand Madison is an established and well-run condominium with a full-time doorman/concierge, live-in superintendent and an amazing in-house valet service (which offers dry cleaning, laundry, tailoring and maid services). The building has a fitness room and is pet friendly. Enjoy city living at it's very best from this central location where NoMad, Flatiron and beautiful Madison Square Park come together. Here, you will enjoy one of New York's most beloved parks, as well as many top-notch shopping and restaurant options (including Eataly, Eleven Madison Park and the original Shake Shack!). There is easy access to multiple subway lines and major transportation hubs such as Grand Central and Penn Station. APARTMENT 5/6 IS PRICED AT $5,550,000 - NEARLY $2 MILLION LESS THAN OTHER COMPARABLE FIFTH AVENUE PROPERTIES DUE TO ITS MONTHLY MAINTENANCE OF $14,742. Building now allows up to 40% financing. Private, serene and refined, this elegant duplex with views of Central Park provides the opportunity for townhouse living in a full-service cooperative. This one of a kind 10 into 9 room home features excellent separation of public and private space allowing for grand scale entertaining as well as comfortable daily living. Bring your architect and re-create an iconic New York residence. First level: From the private elevator landing, enter a gracious foyer, past the sweeping staircase into a generously proportioned living room with soaring 10' ceilings, a gas fireplace and three oversized windows facing west onto the treetops of the Park. Adjacent to the living room is a handsome library with built-in bookcases, a gas fireplace and views of the Carlyle Hotel tower. The impressive dining room with bay window and a gas fireplace leads to a butler's pantry and large square eat-in kitchen with brilliant eastern sunlight. Second level: The private quarters upstairs enable one to design for 2 bedrooms and a sitting room or 3 bedrooms. The spacious master suite and en-suite bathroom feature windows overlooking the park and towers of Central Park West. An adjacent bedroom with gas fireplace and en-suite bathroom can serve as a large second bedroom or den. A hallway leads to a third bedroom with en-suite bathroom and an adjoining office. There is a double staff room filled with light and bathroom with access to the back staircase and kitchen below. 953 Fifth Avenue is an intimate, white glove cooperative developed in 1926 by architect and historian, Isaac Newton Phelps Stokes. Nestled between 76th and 77th street, the building is notable for its striking 25-foot wide limestone facade and gleaming brass detail. 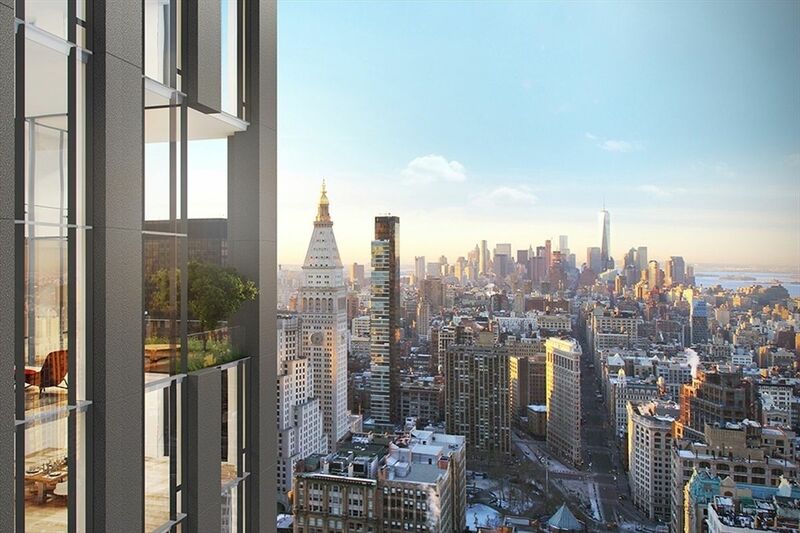 With just seven residences, the building offers an unparalleled level of privacy and service for discreet living. Please note: there is a 2.5% transfer fee to be paid by the buyer. Closings have commenced. Designed by internationally acclaimed architect Rafael Vinoly with luxuriously appointed interiors by Jeffrey Beers International, Residence 38C is a 1,397 SF (130 SM) corner split two-bedroom with south west exposure showcasing panoramic Downtown views including the Hudson River, One World Trade, and beyond. A subtle and serene array of warm, natural materials complements the towers robust modern architecture. Perimeter columns establish an alternating rhythm of vertical floor-to-ceiling windows framing the views along multiple exposures and solid walls for displaying art. Interiors are graced with ceiling heights reaching over ten feet, in addition to a selection of warm woods and elegant natural stones. The open kitchen is a palette of pale-oak cabinets with upper cabinets provided in metal trimmed white back-painted glass with Calacatta Saccheli polished marble slab center islands, countertops, and backsplash which gives the kitchens a luminous glow. The open windowed kitchen is fully customized with a suite of stainless-steel finish Miele appliances including: refrigerator and freezer, wine cooler, gas cooktop with retractable ventilation hood, convection oven, speed oven, and dishwasher. The master bedroom includes a generous dressing area and windowed en-suite bath featuring full height San Nicola marble walls, heated Bianco Dolomiti marble flooring, handsome walnut cabinets with Bianco Dolomiti marble slab countertop with waterfall sides, Kohler Kathryn sinks, and Dornbracht LULU series faucets in a polished chrome finish. The secondary bath is appointed with Bianco Dolomiti marble walls and floors with a black accent trim and Dornbracht fittings. A light-filled suite of amenities, designed by Jeffrey Beers International, spans two floors and offers residents carefully curated spaces for relaxation, socializing, and recreation with a lobby library featuring a double-height bookcase wall, an entertainment suite featuring a bar and private dining room with catering pantry, a fitness club opening onto the furnished Fifth Avenue Terrace, a games lounge, and a kids club. STUNNING BREATHTAKING Views CPW & RIVER!!!! Location! Location! Location! 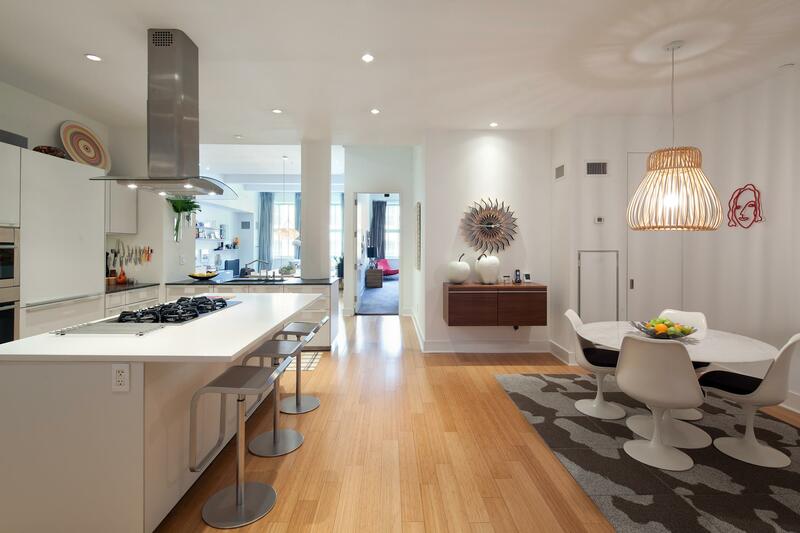 A STEP FROM Central Park, and Columbus Circle.This amazing converted 3 Bedrooms /3 Baths corner unit. The best line in the building!! !Entertain in style with the sleek open kitchen complete with marble countertops and high-end appliances from brands such as Miele, Bosch, and Subzero. All of the cabinetry is custom Italian and all of the countertops are made from Calacatta marble. Split bedrooms are quite spacious, all with spectacular views and excellent closet space throughout. Master en-suite marble bath boasts double vanity sinks and a windowed glass-enclosed.There is a washer/dryer for added convenience. Professionally designed, this home will impress! Be surrounded by Central Park, the Hudson River, and Columbus Circle. Worthy Views in every corner of this home and building! The amenities are as impressive as the apartment from the 24-hour doorman to the skilled concierge staff to the attended parking garage. The Sheffield's amenities go well above and beyond the basics. The state-of-the-art fitness facility is equipped with top-of-the-line exercise equipment, a Yoga/Pilates studio, and his/her spa area complete with sauna.Topping the Sheffield is an enclosed rooftop pool and three sun-decks which overlook Midtown Manhattan. The residents only lounge is stocked with billiards and game tables and a big-screen TV. The Sheffield is near distance to the subway, the Carnegie Hall, and only a short distance from Columbus Circle and Central Park. All of these elements combine to make one of the most desirable buildings in Midtown Manhattan.